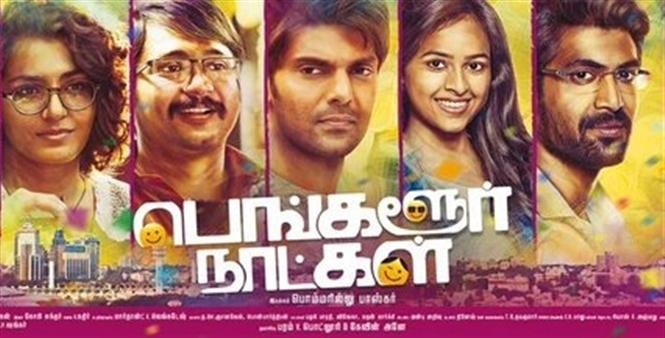 Bangalore Naatkal is an Indian Tamil comedy drama film directed by Bommarillu Bhaskar, which is a remake of the 2014 Malayalam film Bangalore Days written and directed by Anjali Menon. Arjun (Arya), Kannan alias Kutty (Bobby Simha) and Divya(SriDivya) are inseparable cousins who have different dreams of their future , but one common dream is that they settle down in Bangalore and enjoy rest of their life. Arjun is a rebel from his childhood days, lives away from his from a dysfunctional family and enjoy lives to the movement but lacks commitment, Kutty lands in Bangalore in a software job but soon misses his native place and feels awkward living in the city. Divya who wants to pursue her studies is forced into marriage with Prasad (Rana) who resides at Bangalore. Arjun joins them in Bangalore as a racing Bike Mechanic and rest of story is how their lives go through a roller-coaster ride in their city of dreams. Is about lives of two men which change thru an event of mistaken identity. 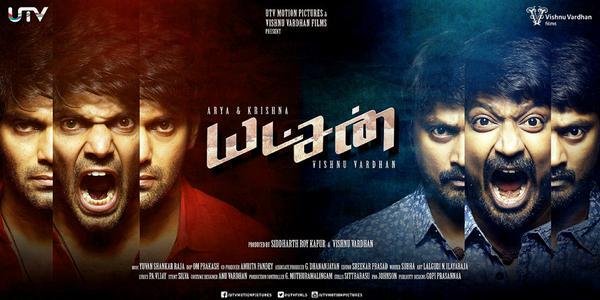 Chinna(Arya) who is a street thug who is on the run and Karthik (Kreshna) who is trying to get into the movies as an actor . Both of them land in Chennai to decide their fate. Chinna desperate to get of the country accepts to commit murder and Karthik is chosen to act in a block buster film. Both their lives takes a twist when their pick up vehicle changes and they land up in alternate destination. How they get out from this predicament is the rest of the story. Vasu ( Santhanam) and Saravanan (Arya) are childhood friends and business partners. When Vasu gets married, his wife is tormented by saravanan’s practical jokes and interference in vasu’s life. So she gives Vasu 6 months time to end saravanan’s friendship or end their relationship. Vasu unable to end Saravanan’s friendship tries to convince him into marriage so that he may be deviated from thief friendship. How he finds a partner for his friend and manages to keep his marriage intact is the rest of the story. The story follows Balusamy (arya)who is a part of a communist organisation which fight for the people, but is branded as a terrorist by law. He is given the capital punishment when he is caught in an attempt to blow a military circuit.he is sent to a secured prison under the strict Jailer (Macaulay) Shaam,where he will spend his last few days before he is executed.Meanwhile his compatriots from his organisation plan his escape plan with the help of the jail hangman Yemalingam (Vijay Sethupathy). Whether Balu escapes from the prison or faces his execution forms the rest of the story. Director Jannanathan is known to spreads communist ideas through his films and he does it also in this film. Arya’s character has so much of depth , but he fails to execute in his acting and dialogue delivery . Vijay Sethupathy brings in some comic relief and gives a decent performance. Shaam also gives a good performance as a Jail superintendent. Karthika Nair fairs in her character but has to work on her expressions other than just twitching her eyebrows. On the technical side art director Selva deserve an applause has his set design of the jail compound looks realistic in all corners as most of story revolves in it. Editing is a disaster as the audience groan in the second half. Dialogues at some places seems good but fails in delivery.Songs has no significance nor connection in the story and could have been avoided. The movie lacks a good screenplay and ends up as just few decent scenes without a string to connect them together. I give it 3/10. Meagamann ‘s story unfolds in the backdrop of Goa, following a drug cartel run by Jothi Bhai (Ashutosh Rana) and his gang. Siva (Arya) a cop is working in the gang as an undercover agent to expose the gang. Jothi bhai maintains a low profile only a few close associates know him by face and his location. When Siva devises a plan to flush out Jothi Bhai in the open, the gang is warned about a traitor in the group. How Siva uses his wits to outsmart the gang and brings them to justice is the rest of the story. The Story set in 1980’s opens with Jeeva (Satya) taken to court by the police. From there the story starts in the form of a flashback. Jeeva and Balaji are class XII students and very close friends. Balaji falls in love with Karthika(Miya George) who studies in the same school and a family friend . Balaji who is afraid to express his feeling to Karthika asks Jeeva to express his love to her on his behalf. But Karthika tells Jeeva that she loves him and not Balaji, thus starts their love story. When their family comes to know about their love, they are totally against it and a series of events makes both families against each other. The two decide to stop seeing each other until their exams, but Karthika’s father cleverly packs the family off to Coimbatore spreading false rumours that they have shifted to Chennai. Thus leaving Jeeva Grief-stricken . Will Jeeva meet Karthika again forms the rest of the story. a doctor falls in love with the kind hearted Madhubalakrishna(Arya) a college professor.While in the fantasy world filled with mythical creatures and enchanting forests Maruva(Arya) lazy and useless son of the army general is always behind Varna (Anushka) a high spirited woman who wants to join the king’s army .The story alternates between two worlds showing the love of both their lives.How they end up in their love life and do both the worlds merge ? forms the rest of the story. 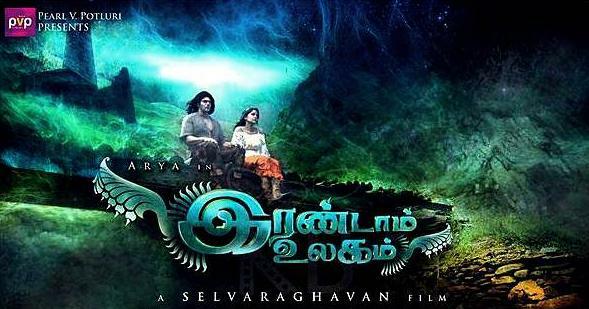 Director Selvaraghavan’s films has always had love as the main theme for all his films, this one is no different, but he has taken a step further to show love across two worlds and with a complicated script.